Description: ost of these chamber works have their origins in stage works, or musical drama with text of one sort or another; not surprising given Henze's enormous contribution to the stage over many decades. All encapsulate the essence of their subject, illustrating episodes from operas (the Potpourri, the violin Sonatina) or evoking vivid atmosphere (the Carillon, commissioned to accompany pictures of the island of Grenada, vividly exotic without being imitative). The 'new folksongs' transmute folk material of Styria in sophisticated harmonic and contrapuntal contexts that nonetheless preserve the naïve and direct nature of the originals. 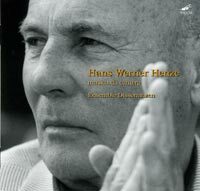 Pared down and economical, in Henze's familiar largely tonal or polytonal style, these pieces represent an extremely accessible aspect of Henze's prolific and richly varied output. Ensemble Dissonanzen; Claudio Lugo.